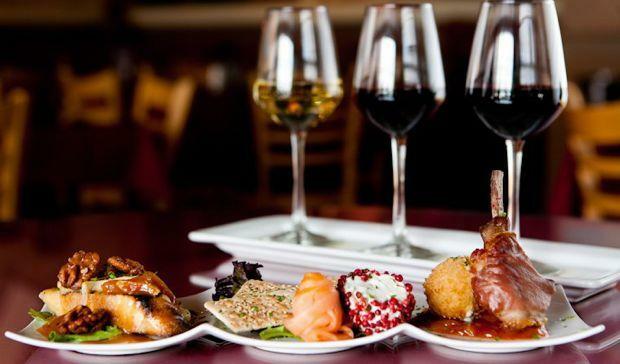 The third Wednesday of every month at 4:30 p.m. MT, Carolyn Joy of Joy Wine and Spirits teams up with a local chef to provide a divine wine and food pairing. With a strong focus on the Colorado community, wine education and local food, KUVO's Wine & Food Pairing will leave you craving more! Deepen your knowledge of wine and browse recipes below. Are you a wine lover? Join KUVO's Wine & Music Club! This month's wine and food pairing had a few twists, first, Brandon of Joy Wine and Spirits filled in for Carolyn Joy this month and (secondly) he brought a beer from Ursula Brewery in Aurora and paired it with a Braised Beef Cheek Bolognese prepared by Executive Chef Adam Vero of Hearth and Dram. This month’s wine and food pairing is an explosion for the palette. Trent from Walter’s 303 Pizzeria and Publik House brings his thrice baked wings, along with his The B.O.M.B. (Basil, Caramelized Onions, Meatball, and Blue Cheese) and Mango Habanero Hawaiian to the Max (Bacon, Pineapple, Fresh Jalapeno, and Mango Habanero drizzle) Pizza’s to pair with Carolyn Joy of Joy Wine and Spirit’s 2016 Bernard Fouquet’s Vouvray. Wine & Food Paring: Argentinian Lamb with La Mascaronne Rosé - "Quat 'saisons"
All it takes is a change of seasons for Chef Tony Zarlenga and sommelier Carolyn Joy to bring out their best! On the May Wine and Food Pairing, Chef Tony from Café Brazil brought in his Argentinian Spring Lamb with fresh herb chimichurri salsa. Paired with it, Carolyn Joy from Joy Wine and Spirits brought in a new Rosé, La Mascaronne "Quat 'saisons." Check out the audio below for the secrets of Chef Tony’s “mint bath” in his marinade. And Carolyn Joy presents a deep dive into the renewed popularity of the rosé on restaurant menus. Wine and Food Pairing : Red Blend with the juicy "Dunbar Dip"
This Month's Wine and Food Pairing spotlights Dunbar Kitchen & Taphouse's "Dunbar Dip" with Joy Wine & Spirits red blend Kivelstadt wine. Host Rodney Franks had a chance to sit down with Charles Wessels of Dunbar Kitchen & Taphouse who brought over Dunbar's signature sandwich "The Dunbar Dip." Carolyn Joy of Joy Wine & Spirits paired it with a red blend Kivelstadt. Joy Wine & Spirits hosts wine tastings every Wednesday and Saturday. This is Eats and Beats, the Alfresco Edition, so named by Arvida, which means what? Fresh. Carolyn Joy from Joy Wine and Spirits anchors our monthly wine and food pairing. Standing outside the KUVO parking lot with Howard Treppeda's brick oven wood-fired pizza, the pizzas were being made and cooked on the spot, and it created quite a stir. Carolyn's pairing choice for the variety of pizzas Howard cranked out, Scarpetta Timido, a perfect summer rosé for our impromptu garden party. Listen below!